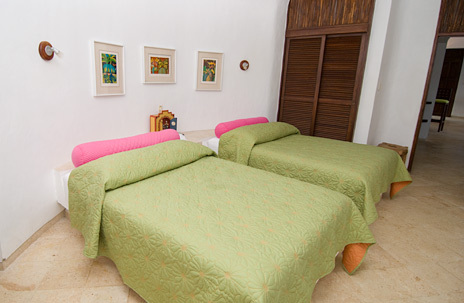 BR #1: Master bedroom, second floor, mainhouse, king bed, ocean views, private bath, a.c.
BR #2: First floor, mainhouse, two doubles, private bath, a.c.
BR #3: First floor, mainhouse, two doubles, private bath, a.c.
BR #4: Guesthouse, queen bed, shared bath, a.c.
BR #5: Guesthouse, one double and one single, shared bath, a.c.
More about Casa Bella. 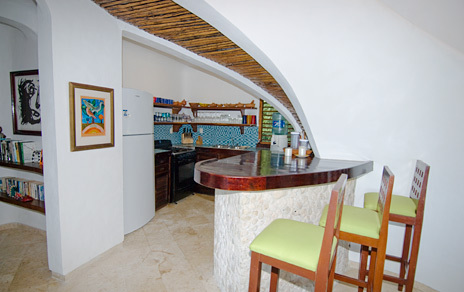 . .
Casa Bella, located at the mouth of Yalku lagoon, was recently remodeled. 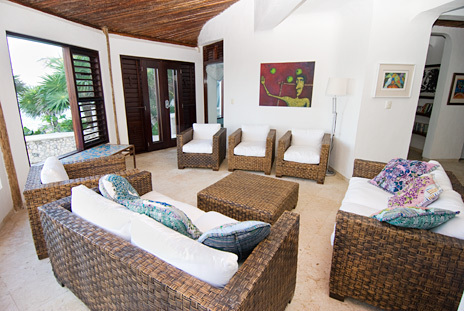 This great waterfront villa has 5 bedrooms that can sleep up to 15 guests. 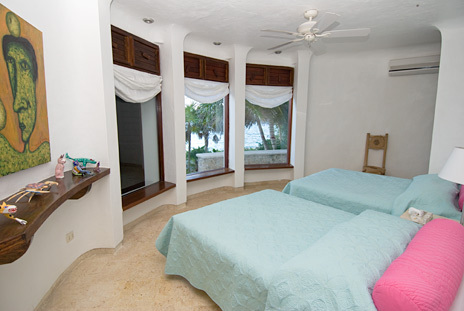 Casa Bella has all that you want for your vacation plus more. 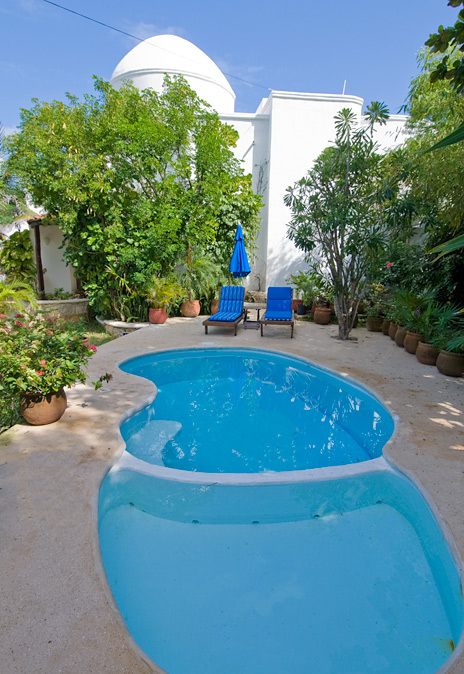 Snorkelers will be thrilled with the access to the amazing Yalku lagoon (no daily fees for Casa Bella guests). And, for your convenience, two bicycles are provided. 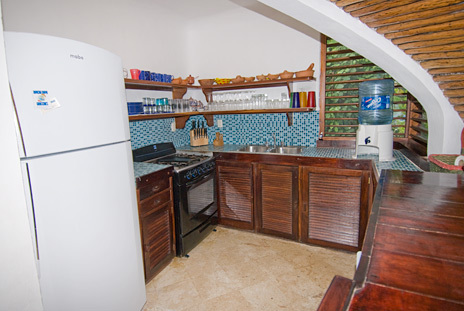 Other amenities include a private swimming pool, wireless internet connection, iPod docking stations and satellite TV. 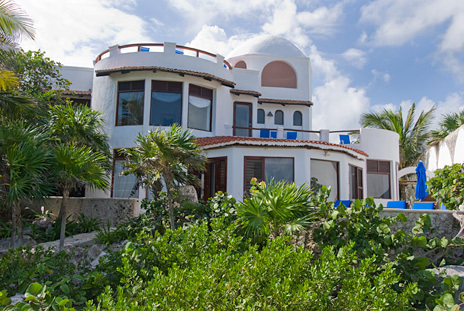 Windows along the entire lagoon side of Casa Bella provide stunning views of Yalku lagoon. 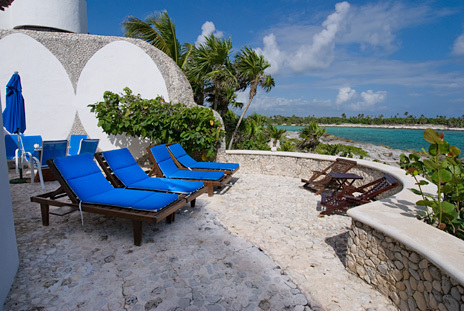 Ourside you'll find spacious patio areas overlooking the lagoon. 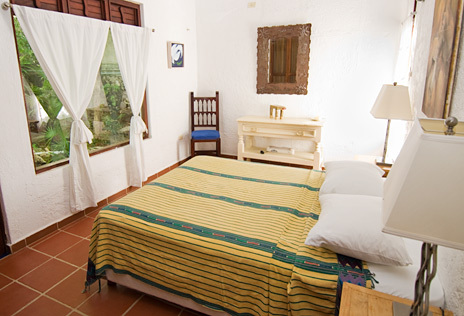 There are three large bedrooms in the main villa plus two additional bedrooms in the poolside guesthouse. Main house includes a living and dining area, kitchen and two large bedrooms on the ground level plus the master bedroom on the second level. 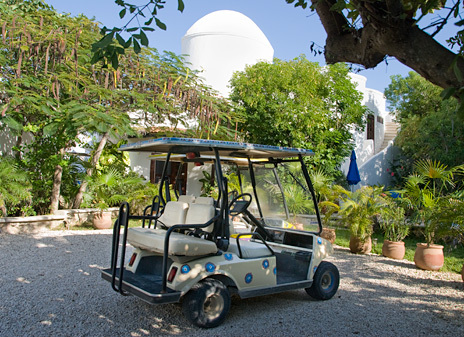 Each of the main floor bedrooms has two double beds, private bath, air conditioning and views of the Yalku lagoon. 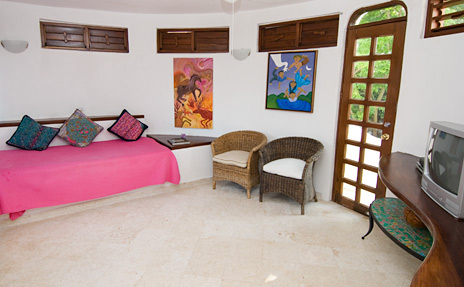 Master bedroom with private study is on the second level of Casa Bella's main house. 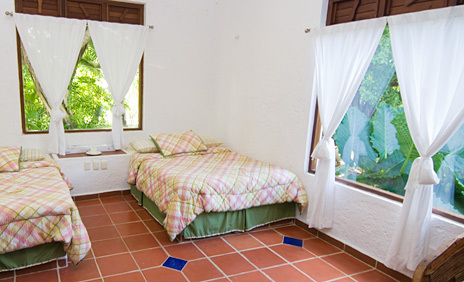 This bedroom is furnished with a king bed and traditional Mexican "Equipal" chairs. 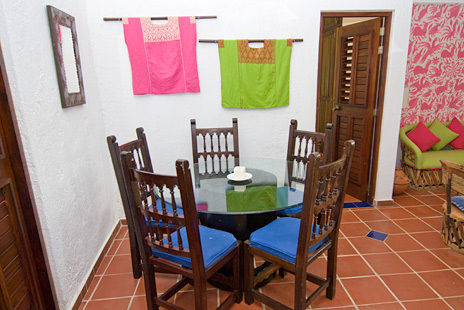 Guatamalan textiles and Mexican crafts create a bright and comfortable space. 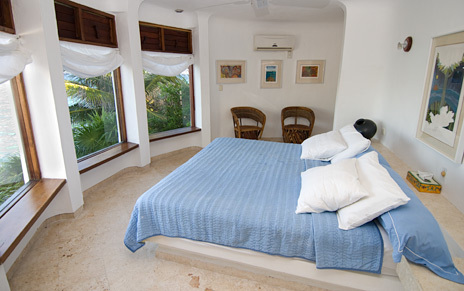 This bedroom has air conditioning, safe, private bath and spectacular views. 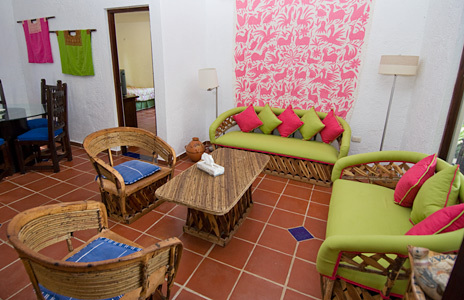 In the guesthouse are two additional bedrooms and living area with satellite TV with DVD player. One bedroom has a queen and the other has 1 double and 1 single bed; these two bedrooms share a bath. 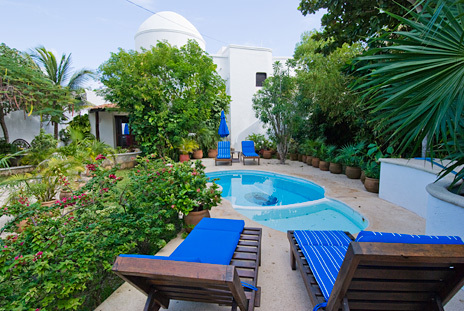 Casa Bella is certainly a delight outside, too! Exit the villa via French doors from the dining area to a lower patio area overlooking the lagoon; a perfect spot for morning coffee or observing Akuma's fabulous night sky brimming with bright stars. 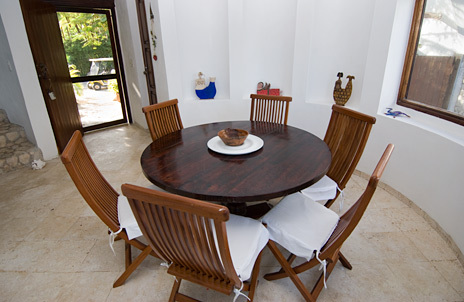 Teak wood lounge chairs and hammock are provided. A new grill is provided and mesquite wood is available. 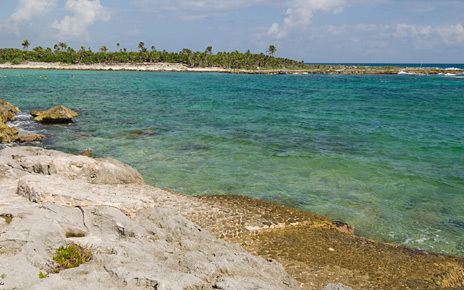 From the lower patio, Yalku lagoon is just a few steps down the coral path.